Guy's Hospital was founded by Sir Thomas Guy in 1721, and built on a site to the south of the old St Thomas' Hospital, which had been here since medieval times until its relocation to Lambeth in 1862. The hospital has considerably expanded over the years with numerous new buildings and facilities but there are a number of courtyards, with sculptures and landscaping, and a Memorial Garden. Rail/Tube (Jubilee, Northern): London Bridge. Bus: 17, 21, 35, 40, 43, 47, 48, 133, 141, 149, 343, 381, 521, 701, RV1, C10. Guy's Hospital was founded by Sir Thomas Guy in 1721, and was built on a site to the south of the old St Thomas' Hospital, which had been here since medieval times until it closed in 1862 and moved to the current site in Lambeth. Sir Thomas Guy was a successful printer and publisher, and a governor of St Thomas' Hospital, who had made money in South Sea stock before the crash. Building commenced in 1721 and the main building with wings and chapel appears to have planned by Thomas Dance although not completed in his lifetime (d.1733), a symmetrical building with cloistered courtyards. The east wing was built in 1738-41 by Dance's successor James Steere and the west wing with the chapel in 1774-7, designed by Richard Jupp who also remodelled the main building. 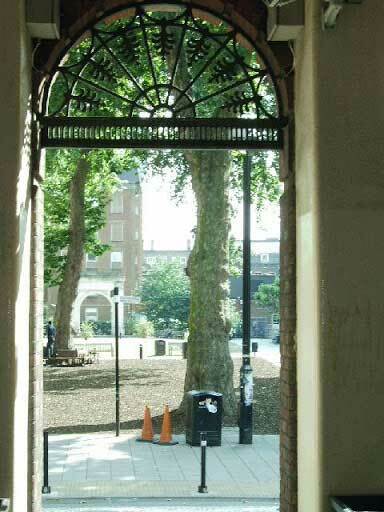 The main entrance with gates and railings of 1741 was on St Thomas Street, to the south of which are the quadrangle ranges and inner courtyards. Guy's Hospital opened in 1726, initially taking in 'incurables' who were not admitted to St Thomas's Hospital but later becoming a general hospital. Sir Thomas had died in 1724, and was later reburied in the hospital chapel in 1780. Beyond the main entrance gates, in the forecourt courtyard adjacent to the chapel, is his bronze statue by Peter Scheemakers of 1739. A passageway leads through the old buildings to an inner landscaped courtyard in which one of the alcoves originally on the Old London Bridge has been installed. The old bridge was demolished in 1831 and the alcove was purchased by the hospital for 10 guineas and resited here for use as a shelter for convalescents. A life-sized bronze statue of the poet John Keats, who trained as a surgeon-apothecary at Guy's in 1815-16, was sited in the alcove in 2005. It was commissioned from Stuart Williamson to commemorate Dr Robert Knight who trained and worked at Guy's. In the other inner courtyard a statue of Lord Nuffield by Maurice Lambert was installed in 1944. South of the older buildings, a Memorial Arch was erected in 1921, which commemorates members of staff at Guy's Hospital who died in both world wars, with the names of 131 people who died in WWI on one side, and on the other the names of 94 who died in WWII. The arch forms the entrance to the memorial garden. Adjacent to the garden is the Children's Memorial Sculpture commissioned in 2005 from artist Carol Misch in memory of children who died at the Evelina Children's Hospital between its opening in 1869 and its relocation to the St Thomas' site in 2005. It consists of a glass sculpture with double helices to represent DNA and has a quotation from Ben Johnson inscribed in the paving around the sculpture.